Southern Nevada Animal Rescue League, exists to provide a better life for adoptable homeless, abandoned, or abused animals. We aim to assist in the effort of limiting the overpopulation of these animals as well as educate the public against breed or size discrimination. There is no such thing as a “bad breed”, only bad humans. Our mission is to make sure all of the animals we rescue are placed in loving, safe, and viable fur-ever homes. Meet Dez. This beautiful young girl is approx. 3 years young and is looking for her perfect forever home. 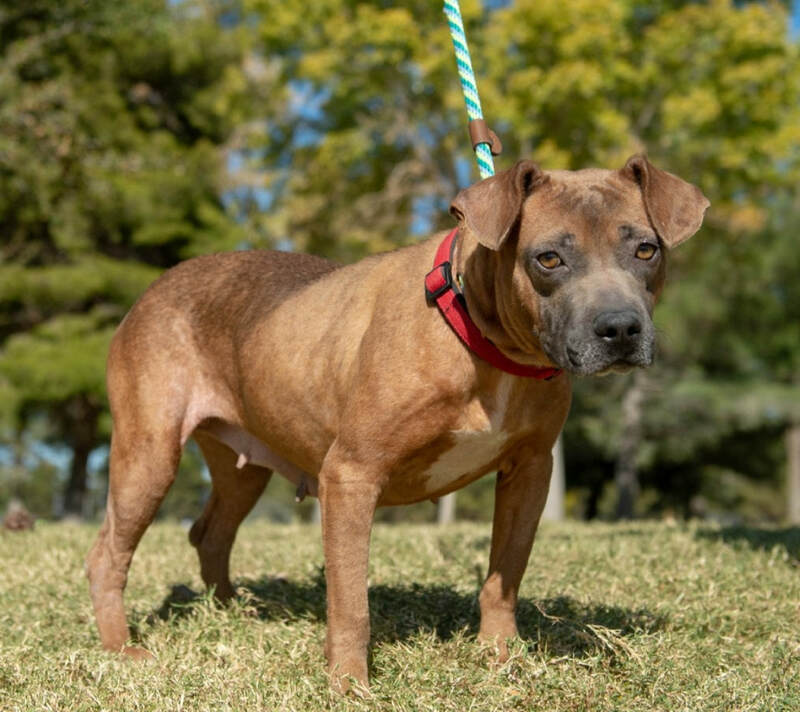 Dez came to us from a high intake shelter in California where she was scheduled for euthanasia because she was fearful and timid. She was part of a group of 13 dogs that were found chained up outside in the backyard of a home where she and the others were primarily used for illegal breeding purposes. Our sweet Dez has truly blossomed in her foster home! She loves to snuggle and have her belly rubbed… and when she gets really excited, she dances and her entire body wiggles. She also smiles, which is the cutest thing in the world. She is a bit shy at first, but warms up with time and patience. She does get startled with sudden movements and she takes a solid 2ish weeks to fully warm up in new environments… so she needs a home with patience and understanding. She is great with kids of all ages, other dogs, and cats. She is a very submissive loving girl. If you are interested in meeting Dez, please complete an adoption application. Dez's forever family must have at least one other dog in the home. As always, all adoptable SNARL dogs are sterilized (spay/neutered), vaccinated, and receive a microchip – all of which is included in their adoption.